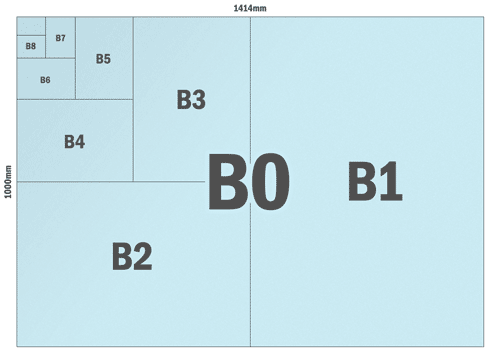 A series paper sizes are some of the most popular in the world, with A4 paper being a standard for home printers and scanners. 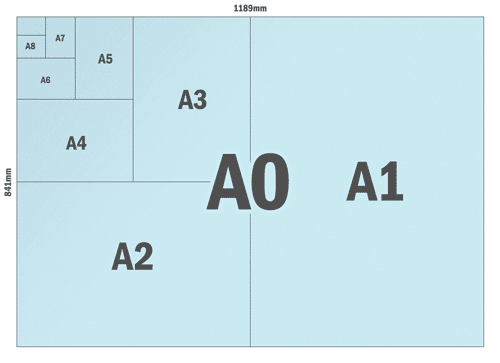 The dimensions are designed with an aspect ration of 1:1.4142 so that they double with each size - A3 is the same as two sheets of A4 joined together, A4 two sheets of A5 and so on. A0 841mm x 1189mm 33.1" x 46.8"
A1 594mm x 841mm 23.4" x 33.1"
A2 420mm x 594mm 16.5" x 23.4"
A3 297mm x 420mm 11.7" x 16.5"
A4 210mm x 297mm 8.3" x 11.7"
A5 148mm x 210mm 5.8" x 8.3"
A6 105mm x 148mm 4.1" x 5.8"
A7 74mm x 105mm 2.9" x 4.1"
A8 52mm x 74mm 2.0" x 2.9"
A9 37mm x 52mm 1.5" x 2.0"
A10 26mm x 37mm 1.0" x 1.5"
B sizes are less popular, and are based on B0 being a metre wide. B5 is a common size for books, and the series is also used for envelopes and passports. Many posters and art prints are printed to approximate B sizes. B0 1000mm x 1414mm 39.4" x 55.7"
B1 707mm x 1000mm 27.8" x 39.4"
B2 500mm x 707mm 19.7" x 27.8"
B3 353mm x 500mm 13.9" x 19.7"
B4 250mm x 353mm 9.8" x 13.9"
B5 176mm x 250mm 6.9" x 9.8"
B6 125mm x 176mm 4.9" x 6.9"
B7 88mm x 125mm 3.5" x 4.9"
B8 62mm x 88mm 2.4" x 3.5"
B9 44mm x 62mm 1.7" x 2.4"
B10 31mm x 44mm 1.2" x 1.7"